"Grantham is a market town and borough, both corporate and parliamentary, in the parish and soke of its name, parts of Kesteven - 110 miles N by W from London, 24 SSW from Lincoln, 21 NW from Stamford, and 14 SW from Sleaford. It is situate on the River Witham, and on the ancient Roman road called Ermine Street; and the great north road from London to York passes through it. Grantham, during the parliamentary war, was an object of interest with the contending parites, and the scene of the first advantage gained by Cromwell over the royalists. The town consists of three distinct sections, the Borough, Spittlegate and Little Gonerby, each having its own regulations, but so united as to form one compact well-built town, the aspect of which is busy and respectable, and its environs exceedingly pleasant: within the last five or six years the number of buildings and inhabitants has increased very considerably." A cemetery for Grantham, Spittlegate, Houghton, Walton and Manthorpe opened in New Somerby township in 1857. It covered 9 acres by 1900. The Grantham Cemetery Burial Registers (1857-1900) are now available from the Lincolnshire Family History Society on 4 microfiche. The Grantham Cemetery Burial Registers (1901-1950) are now available from the Lincolnshire Family History Society on 3 microfiche. The parish was in the Grantham sub-district of the Grantham Registration District. In 1891, the district was re-organized and the parish was assigned to the Grantham North sub-district of the Grantham Registration District. You can also perform a more selective search for churches in the Grantham area or see them printed on a map. The Grey Friars had a house here in Grantham Grange in 1290, but the order was dissolved by Henry VIII in 1540 and no trace remains. Here is a photo of Saint Wulfram's Church, taken by Ron COLE (who retains the copyrights). The Anglican church in New Somerby township was dedicated to Saint Anne. It was erected as a mission church in 1884 and built from iron. It seated about 350. A Mission Church, dedicated to Saint Saviour, was built from brick in Little Gonerby township in 1884. It seated about 150. Saint John the Evangelist Church was built from stone in Spittlegate township in 1840-41. It seated about 1,100. Grantham has been in the Lovenden Wapentake and is currently in the Soke of Grantham. It lies in the Grantham Deanery for which the Lincolnshire Family History Society has some indexes available to aid in your search. Registers exist from 1562. 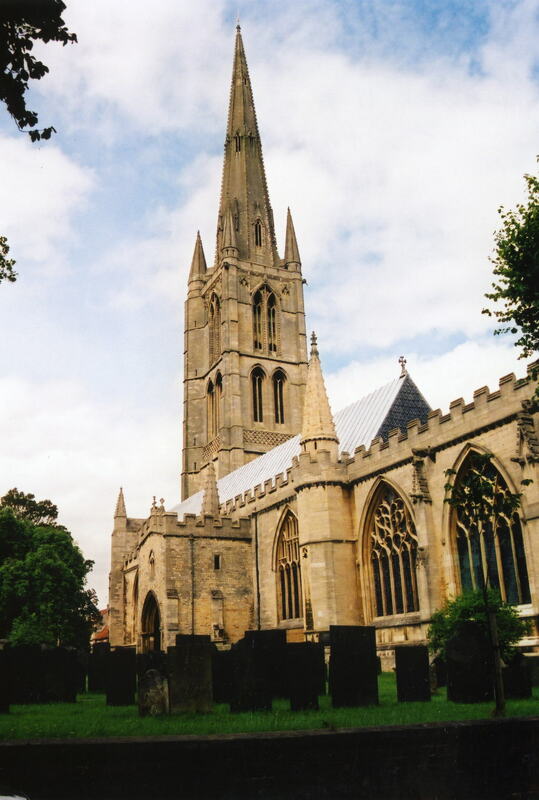 The parish church is dedicated to Saint Wulfram. The Family History Library in Salt Lake City has the parish register on microfilm covering 1562 - 1990, as well as register copies for the Wesleyan Methodist chapel and others, all on microfilm. Registers for Saint John the Evangelist Church exist from 1842. Check the LFHS publications for Grantham Deanery to see which indexes exist to help your search. We have a handful of entries for the ANDREWS family in our parish register extract. There was a Catholic Church, dedicated to Saint Mary, erected in 1832 in Little Gonerby township. The old Gaol here was closed in 1878 in accordance with the "Prisons Act" of 1877. The prisoners were transferred to Lindsey County prison in Lincoln. Grantham is an ancient parish, borough and market town in the west of the county, 24 miles south-west of Lincoln and 110 miles north of London on the old Great North Road. The parish covers about 5,000 acres and includes the hamlet of Walton. Grantham is at the junction of the A1 trunk road and the A52. A list of Trades, and within each classification, the tradesmen. 0033 - Nottinghamshire 1869 Morris & Co. Directory with Grantham, Chesterfield and Gainsborough. Another excellent source is the Lincolnshire Library's list of Directories. The Family History Library (FHL) in Salt Lake City has directories for 1846, 1869, 1897 and 1903. Ask for a calculation of the distance from Grantham to another place. You can see the administrative areas in which Grantham has been placed at times in the past. Select one to see a link to a map of that particular area. Grantham was visited twice by King John. The last time was in 1213. Grantham has a connection with the wife of Edward I, Queen Eleanor. Grantham was the first place that her body rested after her death in 1290. Grantham received its first corporate charter from Edward IV in 1463. History credits Grantham as being the place where Cromwell first had success against the Royalists in May of 1643. The town used to hold a number of fairs for farm animals and agricultural products up until the early 1900's. More recently, Margaret Thatcher has written about Grantham as her girlhood home. Grantham tripled its population between 1801 and 1871, primarily because of the completion of the navigation canal to the Trent River. Find out more about this canal at Grantham Canal Org. Available from the Family History Library in Salt Lake City is Edmund TURNOR's 200 page "Collections for the history of the town and soke of Grantham," publ. 1806, which is available on microfilm no. 990118, item #1. They also have a copy of Malcolm KNAPP's "Grantham : a pictorial history," publ. 1990 by Biddles, Ltd., but only in book form. Call no. is 942.53/G5 H2. Grantham was the first place in the world to recruit and use women police officers in 1915. Mrs. Edith SMITH was sworn in by Grantham magistrates and given full powers of arrest. The Grantham Hospital was on Manthorpe road, about a half mile north of the town. It was built in 1874-75 and was opened by the Lady Brownlow in early 1875 as an in-patient facility. A childrens' ward was added in 1888. It is unknown if any records of patient admissions or care remain. Hospitals were not required to archive their records. The hospital was still in use in 1900. In the south aisle of Saint Wulfram's Church is a monument to Captain William CUST, RN, killed in an attack on Port Louis. Directories give the date as 8 March 1747, but other sources give the year as 1748. Pam SHEPHARD tells us: Militia Barracks built 1858 and extended 1872 for Royal South Lincolnshire Militia - there are some photos in "The Book of Grantham" by Michael HONYBONE, ISBN 0 86023 425 8, including a picture of "Convalescent troops in the Red Cross Hospital at the Barracks" so it was also used for that purpose. Now used by Grantham College. In 1881, the 4th Battalion of the Lincolnshire Regt. of Militia consisted of 26 officers and 872 privates. It was headquartered in Grantham in Harrowby township. Colonel Earl BROWNLOW, commandant; Lieutenant-colonel MOORE; Majors Charles J. PARKER and A. JEBB. The Regiment was embodied in 1759 for the Seven Years' War (and records prior to that have been lost). The regiment had been in Sleaford in 1832 and moved to Grantham in 1852. Harrowby township, in 1900, held the barracks of the Royal South Lincolnshire Militia (otherwise known as the 4th Battalion of the Lincolnshire Regt.). The first building of the barracks was erected of blue stone in 1858 and the second in 1872. In 1881, the Third Lincolnshire (Grantham) Rifle Volunteers, which formed in 1859, consisted of 120 men. John F. BURBRIDGE was the captain commandant; James HUTCH, captain; Arthur HUTCHINSON, lieutenant; and John Bernard SCHOFIELD, second lieutenant. In 1896, the Royal South Lincolnshire Militia (also known as the 4th Battalion Lincolnshire Regiment) was at its barracks in Harrowby. Col. Lord William CECIL, commanding; Lieut.-Col. E. B. BURNABY and Lieut.-Col Sir J. de HOGHTON assisting. 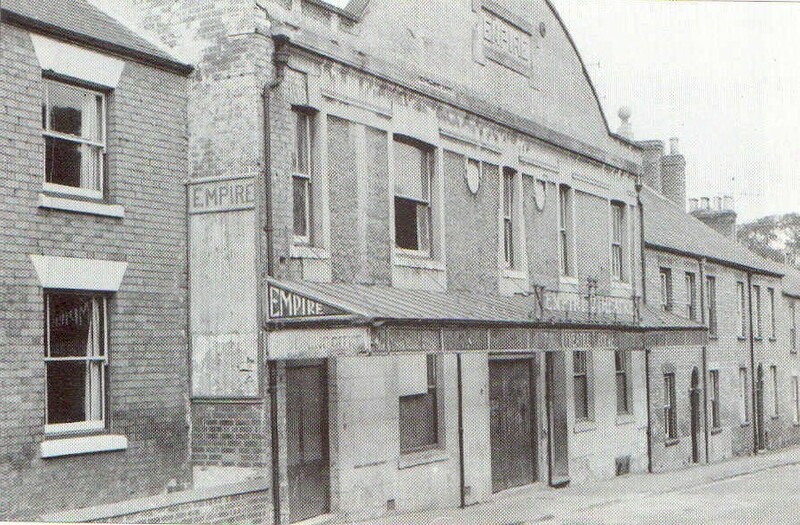 And the 2nd Volunteer Battalion Lincolnshire Regiment were headquarted at the Drill Hall on Wharf road. In 1900, the Militia Barracks were assigned to Capt. A W. DEWAR, Adjutant. In 1900, Grantham was the headquarters of the 2nd Volunteer Battalion of the Lincolnshire Regt. In 1915, a Machine Gun Corps training facility was set up at the army base in Belton Park. During World War I there was a military hospital established at the army base at Grantham Camp. The hospital had 670 beds. RAF Grantham was a military facility, but not an airfield. The local RAF airfield was in Spitalgate. RAF Grantham, also known as RAF Grantham St. Vincent's, was the headquarters of Bomber Command No. 5 Group from October, 1937, to November, 1943. In November, 1943, it became the HQ of Troop Carrier Command. In 1944, Grantham was awash in servicemen preparing for the invasion of Europe. Sometimes their behavior became news fodder when the locals were offended. "Local Men who are Serving King and Country"
Father and five sons, Robert SHERRIFF, senr. Mine-Sweeping, Will SHERRIFF, Mine-Sweeping, George Ernest SHERRIFF, R. SHERRIFF, junr. Mine-sweeping, Joe. SHERRIFF, Mine-Sweeping, Jack SHERRIFF, Mine-Sweeping. Ptr. E. A. WELTON, Army Service Corp. On active service. Drvr. S. S. BEE, 2nd. 1st N.M.B., R.F.A. Sergt. J. W. IMISON 1st N.M.B. In 1900, Lieut.-Col. Alfred Cholmeley Earle WELBY, member of Parliament, is listed as a county magistrate for Spittlegate petty sessions here. He would be buried in 1937 in Denton, Lincolnshire. Likewise, Lieut.-Col. Charles John Bullivant PARKER was also list as a county magistrate in 1900. He had been born in Swayfield, LIN. Major William LONGSTAFF resided here in 1900 in Little Ponton Hall. In Middle English the name would be pronounced as "Grant-Ham". In Modern English we have "smoothed" the name to "Gran-Tham". Thomas PAINE, the American revolutionary and essayist, was appointed as an Excise Officer here in Grantham in December, 1762. In August, 1764 he was tranferred to Alford. Grantham Journal, published on Saturdays by Henry M. ESCRITT on High Street. Grantham Times & South Lincolnshire Gazette, published Fridays on Wharf Road. Mr. Arthur HUTCHINSON was Mayor in 1902. The parish was in the ancient Loveden Wapentake in the Soke of Grantham in the South Kesteven division of the county, in the parts of Kesteven. The Soke of Grantham was a separate liberty under the borough magistrates until 1826. For today's local governance, contact the South Kesteven District Council. The parish is divided into five townships: Grantham, Harrowby Within, Manthorpe (with Little Gonerby), New Somerby and Spittlegate Within. Spittlegate is in the Winnibrigs and Threo Wapentake. Bastardy cases would be heard in the Grantham petty session hearings held at the police station at 11am on Saturdays. The Rev. Thomas HURST endowed several almshouses in 1671. Bradley's Almshouses, built in 1874 in High Street, burned down in 1875 and were rebuilt. They were used by six females aged 63 or older who were members of the Church of England. These were still in use in 1900. As a result of the Poor Law Reform Act of 1834, the parish became part of the Grantham Poor Law Union. Isaac NEWTON attended the Grammar school here aroun 1650. The Grantham Technical Institute opened in February, 1898.